Thor Network, the leading atomic-swap-powered DEX, announced a strategic partnership with NEM, one of the leading blockchain platforms, on November 22, 2018 to accelerate cross-chain technology developments and promote blockchain industry awareness. The first step of their cooperation will be the listing of NEM coin on Thor Network’s instant crypto swap platform, Thor Swap. 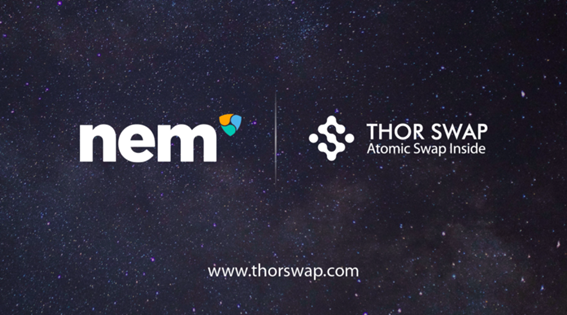 Investors will soon be able to trade NEM with bitcoin, ETH and 40+ major coins and tokens instantly on Thor Swap without account or registration requirement. The partnership will also be the opportunity for both Thor Network and NEM to collaborate on the development of cross-chain technologies. Leading in “cross-chain atomic swaps” technology, Thor Network’s “Atomic Settlement Network” (ASN) supports instant and seamless swap transactions of crypto assets across different blockchains and Dapps. According to the partnership signed with NEM, NEM 2.0 and NEM based tokens will be included in the first batch of crypto assets supported by ASN. Blockchain technology is one of the key technology breakthrough of the 21st century that brings trust and safety through peer-to-peer distributed ledger and time-stamped transactions. Thor Network and NEM are both deeply involved in the development of blockchain technologies and believe firmly that their partnership will contribute to push forward the adoption of Blockchain. Thor Network provides leading decentralized exchange solutions to enhance the performance of existing DEXs and bring disruptive changes to the digital asset exchange industry. Thor’s ASN technology is a highly promising technology allowing data and value transfer across different blockchains. Thor Swap is the decentralized instant crypto swap platform developed by Thor Network team. Thor Swap outstanding features include decentralized atomic swap technology, reserve pool model, and best token swap services.